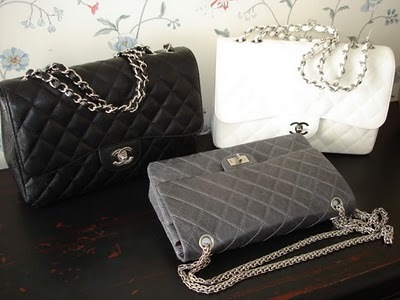 My clients often ask me the difference between the Chanel Classic Flap and the Chanel Reissue 2.55 bags. There is in fact a huge difference in appearance.The biggest difference in both bags in the sizes that are available. The lock on the Reissue is the original lock, it is called the Mademoiselle Lock as Ms Coco Chanel never married, the ‘CC’ lock was introduced to the Classic Flap Bags only in the 1980s by designer Karl Lagerfeld. The 2.55 in its name refers to the first release of the 2.55 bag in February of 1955. Coco Chanel grew up in an orphanage/convent, therefore, the double chain shoulder strap comes from when the children’s’ caretakers in the orphanage would dangle keys from their waists with the same type of chains as on the Reissue. Also, the zippered compartment on the inside of the front flap of the Reissue is where Coco sequestered her love letters, as she was having an affair at that time. The brownish red color of the inside represents the color of Coco and the rest of the children’s uniforms (the nuns’ were black with white trim: thus, the packaging on Chanel Parfum/Eau de Parfum/Eau de Toilette). The back outside flap of the Reissue actually marks where Coco would stash extra money! Over the years there have been many variations to the original design of the 2.55, including the leather/fabric, the chain – metal vs. interwoven leather, single flap vs. double flap, and the closure – mademoiselle vs. interlocking CC. The 2.55 refers to all flap-style bags, including variations of the original! The term classic flap commonly refers to the flap with the interlocking CC closure and the leather interwoven chain. In February 2005, Karl Lagerfeld re-made the 2.55 – exactly as Coco Chanel had made in 1955, in commemoration of the 50th anniversary of the 2.55. It came to be known as the Reissue. Technically the term Reissue should only be used for the bags that were made to commemorate the original – so only those in 2005. However, it has become convenient to call all 2.55s that resemble the original 2.55 Reissues and all 2.55s that have the interlocking CCs Classic Flaps. 1. Closure/Locks: Classic has the double CC turn-style lock, the Reissue has the Mademoiselle lock (rectangular shape). 2. The handle: The reissue has an all chain handle, while the classic has leather interwoven between the chain links. 3. Reissue has a different type of leather, that is made to seem more worn than the caviar leather on the classics. 4. All the reissues have a double flap inside, whereas the Jumbo Classic does not. 5. The sizes on the Reissue are different than the sizes on the Classic Flaps.